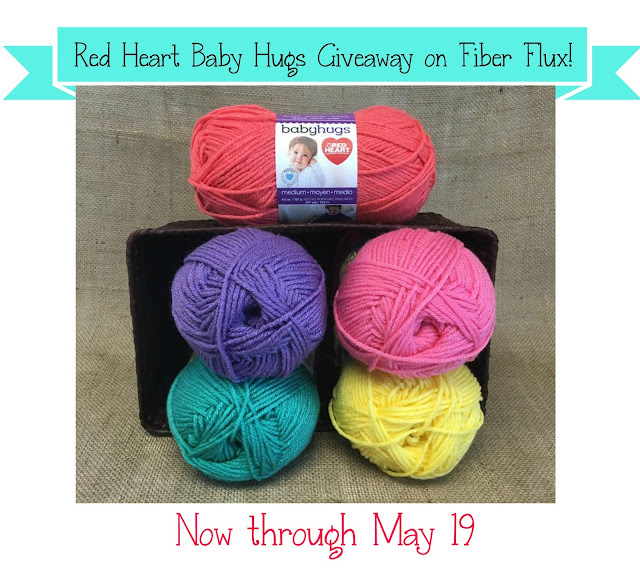 Fiber Flux: Red Heart Baby Hugs YARN Giveaway! Red Heart Baby Hugs YARN Giveaway! Enter to win using the Rafflecopter below. Giveaway ends May 19th and is open to North America residents only (US, Canada, and Mexico). Now go, go, go and enter!! I have two pregnant coworkers so I'd make one of them a blanket, or maybe a toy. I would knit a hat with the yarn. Probably a lovey or a hat. I have a baby shower to attend really soon. I love all the bright colors available with this yarn! This is an awesome give away! I would make a prayer shawl. Thanks for the chance to win! This yarn has gorgeous colors and I love the little tub that yours came in! Also a very nice pattern! New babies in the family always get a blanket. I'm always on the lookout for yarn and patterns. Not sure what I would make...no babies on the horizon. Maybe a cap for my SIL who is enduring cancer treatment. I would make a throw with the Baby Hugs yarn. It looks so soft. This yarn is so pretty and looks so soft! I would make a blanket for friend's baby on the way! I would make something for my new grandbaby! This yarn sounds so nice! Thank you for this giveaway! I'd make some soft, pretty cocoons with this yarn. Babyhugs looks amazing - I can't wait to knit with this yarn! I would make a baby sweater with this yarn. It looks so soft. This would be a great way for me to learn tunisian crochet with a baby blanket! Thank you for a awesome contest with great prizes !! I would like to try this with a blanket, or hats. This yarn looks very soft and the colors are gorgeous. Would love chance to win the Red Heart Prize package. Could do a lot more knitting and share with my sister for her crocheting. I would have to have the yarn in hand to say for sure what I would make. I'm a hands on type of person. I go to yarn stores and pick up yarn that talks to me and it tells me what to make....lol. This yarn looks like it would make a really warm winter blanket or maybe a bunting (cocoon). I would make some nap time blankets for my niece's day care cent. Awesome colors. Confused on how to enter. Please clarify, thanks. Would LOVE this yarn for a Baby item for my nieces upcoming BABY !!! This yarn looks beautiful. I think I would make a baby blanket. I love Red Heart yarn! I would make something for my first Grandchild due June 19th! Grand babies coming in the fall. Can't wait to use this yarn! I would be delighted to crochet the tutti-fruity baby blanket by the Tunian Crochet Chic! Love the colors....so many ideas!!! Thank you for the chance to win! So awesome, I'd make some hats and loveys to donate to the children's hospital. Would love to make something for the twins! I would love to make some shawls with matching fingerless gloves. I'd like to make baby hats, or maybe a sweater. Thanks for the giveaway! Ooh, I have several baby patterns I've been looking for the right yarn to make them. Would LOVE to see how this works up. This is such nice yarn! If I were to win I would make a baby blanket for a friend that is expecting. Every baby should have a homemade blanket. I would make a baby blanket. What pretty yarn! Thanks for the giveaway. I enjoy trying new yarns. Winning this yarn gives me the opportunity to try the yarn without the cost which is very enticing. I have two young great grandchildren and I am always makings hats, scarfs, sweaters, etc for them. Thank you for this opportunity. I plan to make a baby blanket for my beautiful new grandson!! What a wonderful getaway. I would make a Hexagon baby hoodie for baby coming into the family. I'd love to use this yarn for soft blankets and beanies.